The Wright Brothers flew their airplane successfully on December 17, 1903 at Kitty Hawk, North Carolina in the Outer Banks. 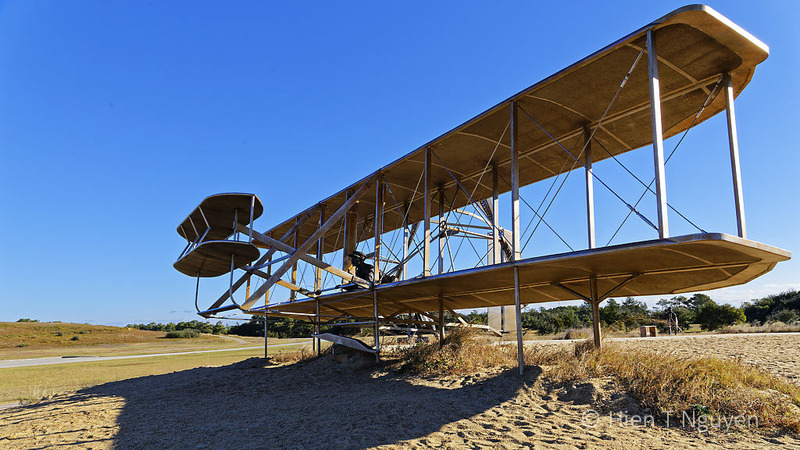 Today there is a Wright Brothers National Memorial at the spot, with a visitor center, a monument, and sculptures of their bi-plane and that historic moment. Replica of first bi-plane. Orville Wright was the pilot. Replica of first bi-plane and first flight moment. Wilbur Wright behind the bi-plane. The two brothers each flew their bi-plane twice that day. Their final flight covered 852 ft (260 m) before the bi-plane struck the ground and broke part of its frame. We visited this place almost five years ago. We arrived too early, before the visitor center was open. But it was a beautiful day for photography. Great photo, you know it has not been that long ago in the big picture, has it? Since I was married in 2016, my husband and I have taken to visiting the National Parks System and I hope to get to see this place soon. That reminds me of the time I arrived too early for the opening of NASA space center outside Houston. I was struggling with jetlag and did think about sleeping my hire car but I thought that might not be a good idea, so I went back to my hotel and slept! I never made it back! 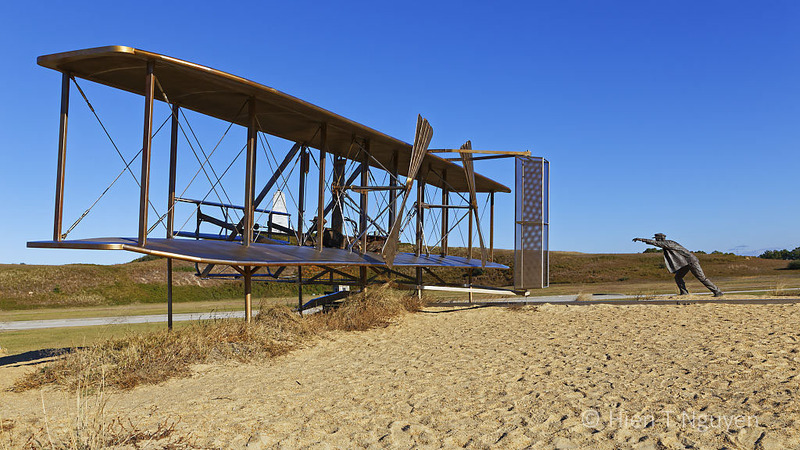 As a bit of a plane-spotter myself, my late father having worked for South African Airways for so many years while I was growing up, I would love to visit Kitty-Hawk. Thanks for taking us along, Hien! Two great adventurers. They changed the world profoundly. Thanks! I love to know that people enjoy my home state. The visitor center will soon be completely renovated, please visit again.